A single cell of the kind referred to collectively as sympathogonia or primitive cells of the sympathetic nervous system. Primitive cells of the sympathetic nervous system derived from neuroblasts of the neural crest. They have dense nuclei, rich in chromatin, and only a thin rim of cytoplasm, and differentiate to form along one line ganglion cells and along another line chromaffin cells. A leading childhood form of cancer that arises in the adrenal gland or in tissue in the nervous system that is related to the adrenal gland. It is considered to be the most common solid tumor outside the brain in infants and children. Undifferentiated embryonic cells that develop into sympathetic nerve cells. 1. Denoting antagonism (interaction between chemicals in which one partially or completely inhibits the effect of the other) to or inhibition of adrenergic nerve activity. 1. A description of a drug that stimulates the sympathetic nervous system or produces physiological effects similar to it. 2. Producing effects resembling those of impulses transmitted by the postganglionic fibers of the sympathetic nervous system. Any disease caused by syphilis. Suffering caused by the same thing as was habitually used previously. 1. Anyone who utilizes extrasensory perception of his, or her, mental activities with another person. 2. Someone who communicates through methods other than the normal senses, as by the exercise of mystical powers. 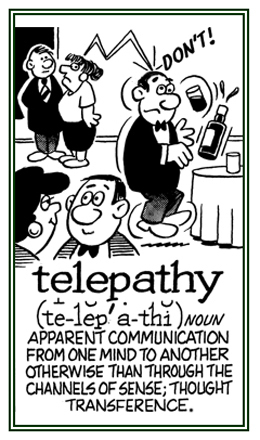 To practice, to communicate nonverbally, or to conduct, telepathy; that is, knowledge of, or response to, an external thought or objective event not achieved as the result of stimulation of the normal sense organs. 2. The ability to connect directly by psychic means with others via thoughts, feelings, or emotions at a distance without using normal sensations: June couldn’t explain why, but she had a definite sense that her twin brother, who lived about 1,000 miles away, needed her help and wanted her to come. 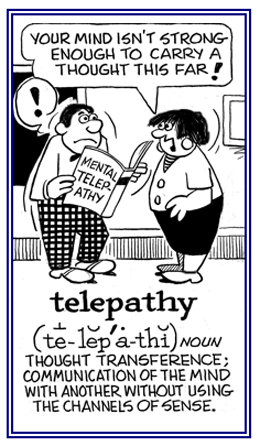 She had heard about such communication by extra sensory means and decided this had to be telepathy. © ALL rights are reserved. Any disease of the testes. Showing page 27 out of 29 pages of 435 main-word entries or main-word-entry groups.